If you’re looking for a way to increase sales on your WordPress e-commerce website, it’s time to consider a bulk add to cart WooCommerce plugin. Customers can buy more quickly if you let them add multiple products to the cart at once. They simply tick a checkbox next to each product and click a button to add them all to the cart. It’s the perfect way to increase your WooCommerce store’s conversions. Today, I’m going to tell you how to use our popular WooCommerce Product Table plugin to add bulk add to cart buttons in WooCommerce. What is the bulk add to cart WooCommerce plugin? WooCommerce Product Table is our bestselling WordPress plugin and works perfectly as a bulk add to cart plugin. It lists products in a customizable table layout, with a tick box next to each item. There will be an ‘Add Selected to Cart’ button above and/or below your product tables. You can create a single product table listing all your products with multiple add to cart buttons. Or you can create tables listing specific products only (e.g. by category). There are options to add tables anywhere on your site, or to replace the default layouts on the main Woo shop and category pages. You can configure pretty much any aspect of your product tables. For example, you can choose which columns of product data display in the table. You can choose whether or not to show quantity selectors and product variations in the table. It’s even possible to control how the table and quick add to cart buttons behave responsively on mobiles and tablets. Create your bulk add-to-cart solution for WooCommerce today! First, get WooCommerce Product Table and install it on your WP website. I’m assuming that you’ve already got a website with WooCommerce setup and some products. Go to WooCommerce > Settings > Products > Product Table. For the ‘Add to Cart button’ setting, choose the ‘Checkbox only’ style to display a multiple add to cart checkbox next to each product. Choose ‘Button & checkbox’ if you want a add to cart button AND bulk tick boxes. Create a page where you want to add a product table. Add the shortcode [product_table] to the page. Enter any further product table options to the shortcode. If you want to use product tables directly on the main WooCommerce shop page, follow the instructions in the knowledge base to add the product table layout directly to your theme’s template file. Finally, view the page and you’ll see your tables with WC bulk add to cart checkboxes next to each product. The whole point of a bulk add to cart Woo plugin is to make it quicker for people to buy from you. With that in mind, I’ll give you some tips on how to encourage customers to add multiple products to the cart. Use these to get more sales by encouraging each customer to buy more products. Are customers likely to add multiple products to the cart? First, you need to decide whether the products you sell will benefit from quick buy options such as a bulk add to cart WooCommerce plugin. Multi-select checkboxes are a major asset to many WooCommerce stores (including wholesale WooCommerce stores). However, they’re not for everyone. Customers are more likely to add multiple products to the cart when you’re selling relatively small, low-cost items; or products that are designed to be used together. Low cost products. Low cost products sell better with a bulk add to cart WooCommerce plugin. This applies to any store where each product isn’t a major buying decision. For example, stationery, cosmetics and make-up, food and drink, gifts and toys. Subtle improvements like quick buy checkboxes can convince them to buy more. You can boost this with postage discounts for multiple items, or quantity-based bulk discounts. Make sure your customers know they can save money, and use a bulk add to cart WooCommerce plugin to make it quick and easy. Build a box. WooCommerce Product Table is popular for selling build-your-own products such as gift hampers or wine boxes. The box contents are listed in a table. Customers use the quick add to cart buttons to bulk select the box contents. Once they’ve ticked the required items, they add all selected products to the cart at once. Restaurant order form. Many restaurants use WooCommerce Product Table as an online restaurant food ordering system. They add their restaurant menu to a single page, with a separate product table for each section (e.g. starters, mains, sides). Each product table has bulk add to cart buttons with an ‘Add Selected to Cart’ button. Customers tick all the food options from one table, add them to the cart in a single click, and then choose items from the next table. This is much quicker than clicking individual add to cart buttons for every product. Related products and sets. If you’re selling multiple products designed to be used together, then WooCommerce bulk add to cart buttons will make the process more user-friendly. Perhaps you’re selling kitchen units where customers choose their own combination from a set of items such as worktops, cabinets and doors. Customers need to plan their entire purchase before adding to the cart. When they’re ready to order, WooCommerce bulk buy checkboxes make it much quicker to buy. 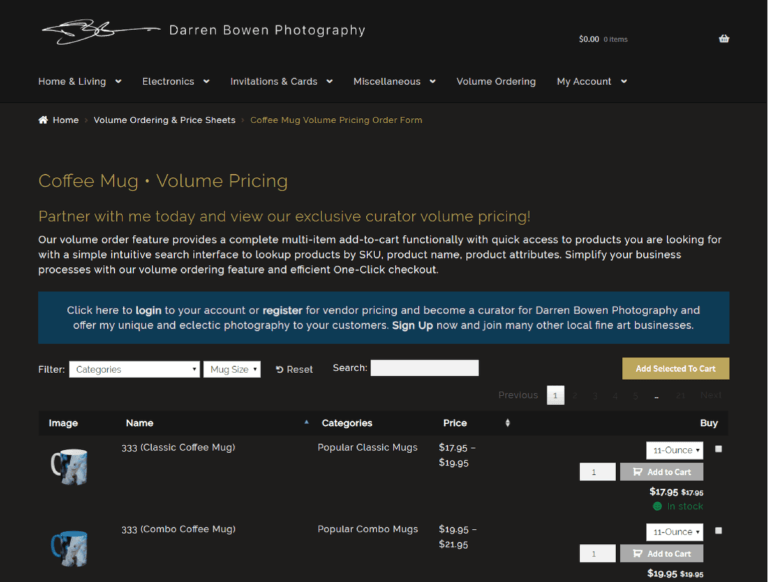 Darren Bowen Photography sells a range of products printed with Darren’s unique artwork. To help customers quickly buy multiple products there are two bulk ordering pages powered by WooCommerce Product Table. One for mugs and the other for iPad smart covers. To buy multiple items, you simply select the quantities and use the “add to cart” function or check the “buy it” box. Once you’ve put everything you need in the cart, you can check your order before making your payment. And to keep things simple, there’s an easy to use one-click checkout system. Keep reading to learn how to add similar WooCommerce bulk order forms to your own site. Which WooCommerce products don’t need bulk add to cart buttons? As you can see, many types of product will sell best with a plugin that provides quick buy options. However, a bulk add to cart WooCommerce plugin isn’t going to help you with major purchases such as selling furniture online. If each purchase is a major decision for the customer, then adding quick check boxes won’t really encourage them to buy more. Think about whether the types of product in your store lend themselves to a quick bulk add to cart format. There’s no point having a WooCommerce bulk add to cart plugin if customers still need to visit the single product page before they buy. The whole purpose of the quick add to cart checkboxes is to allow customers to add multiple products directly form the main shop or product listings page. This means that your WooCommerce product tables need to contain all the information that is needed to make purchasing decisions. You can do this by choosing which columns appear in the product table. The WooCommerce Product Table plugin supports all the standard product data that WooCommerce stores. Read the full list of available columns and choose your columns wisely. Add the product data that will actively encourage customers to buy without clicking elsewhere. You can even add extra data such as custom fields and taxonomies. These are ideal for adding any further information or downloadable documents that will help customers to reach a quick buying decision. Activate the quantity selector on the WooCommerce Product Table plugin settings page. This lets customers choose a quantity before selecting the product and adding it to the cart. Use one of the options to show variable products in the product table. You can show product variations as dropdown lists next to the bulk add to cart boxes. Alternatively, each variation can have its own row in the product table with a separate add to cart checkbox for each one. If you’re using the WooCommerce Product Add-Ons plugin with WooCommerce Product Table, then the extra product options will appear next to the bulk add to cart check boxes. These two plugins work perfectly together, so this is a good way to add extra product options if variable products aren’t right for you. For example, you can add extra options as checkboxes and radio buttons, or even add text fields where customers can add a personal message for each product. All this works directly on the product listing page, so customers can choose their options and add multiple products to the cart. Bulk add to cart buttons are just one way to speed up the buying process in WooCommerce. It works because products become more visible, faster. The WooCommerce Product Table plugin comes with plenty of features to help customers find products more easily. All these improvements work together to truly improve your sales and increase conversions. 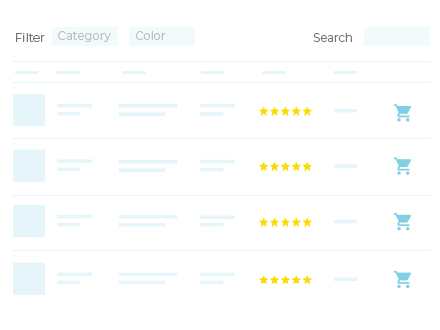 For example, add filter dropdowns or filter widgets to let customers quickly refine the list of products. They can choose their filters, view a list of products they’re interested in, tick the boxes and add multiple products to the cart in bulk. Keyword search above the product table offers another way to do this. Performance and page load time is also important. If you have lots of products, you can use the lazy load option to load fewer products at a time. Lazy load lets you list hundreds or even thousands of products in a table. It minimizes load time and avoids potential speed and performance issues. 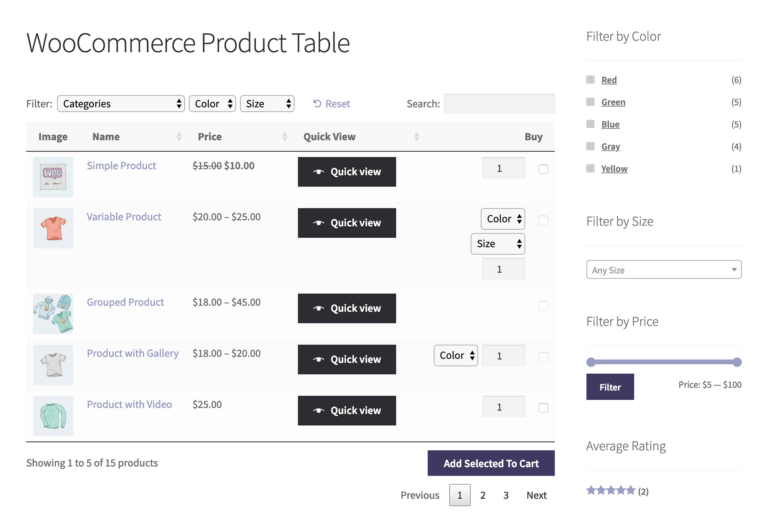 Help your customers even more by adding Quick View to your WooCommerce product tables. Bulk add to cart plugins are all about helping customers to buy as quickly as possible. So what happens if you have too much information, or too many product options, to fit in the product table? Obviously, you don’t want customers to have to visit the single product page. After all, this would slow down the buying process and defeat the purpose. Instead, you can enhance your product tables with the WooCommerce Quick View Pro plugin. This handy plugin works hand-in-hand with WooCommerce Product Table and your bulk add to cart buttons. It adds quick view buttons or links to the product tables. Customers can view more product information and purchase options in a quick view lightbox. They can then either select variations and add to the cart directly in the popup, or they can quickly close it and use the bulk add to cart buttons in the product table. Now you can create your own WooCommerce bulk add to cart buttons! Now you know everything about how to use a bulk add to cart WooCommerce plugin. It’s the easy way for customers to add multiple products to the cart at once. As you have seen, it will really speed up the buying process on your store. Research shows that faster customers can use an e-commerce shop, the higher your conversion rate and sales will be. Test the add to cart checkboxes on our WooCommerce quick order form demo. Get the plugin today and add bulk add to cart buttons to your WooCommerce store straight away!